Ten pounds for ten dollars. 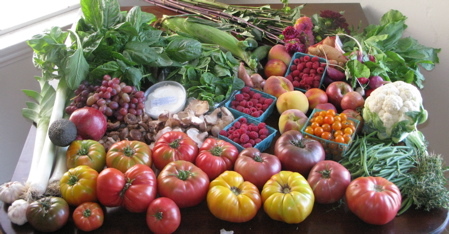 Bargain bulk pricing on glorious heirloom tomatoes, all with more wrinkles and character than John McCain, means only one thing: “shoulder season.” So proclaimed the Wife as we strolled down overflowing stalls of fruits and vegetables at this Sunday’s Hollywood Farmer’s Market. 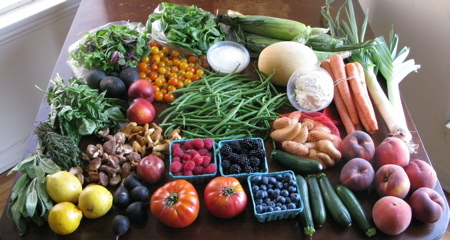 We had been out of town and missed the Market for the last two weeks, and the end of summer and beginning of fall were very apparent. Gone were the parades of stone fruit, bushels of summer corn, and piles of ole rhubarb, while new hints of fall squashes started blooming. I had been forced to resort to the grocery store in the interim, buying produce shipped from thousands of miles away and stinking of wasted fossil fuels. It was great to be back at the Market bumping into to old friends and new. In addition to our overflowing box of heirloom tomatoes and a basket of little sungolds, we picked up raspberries, grapes, an avocado, a pomegranate, peaches, nectarines, apples, radishes, fingerling potatoes, leeks, cauliflower, haricot verts, shallots, zucchini, bi-color corn that has probably passed its peak, garlic, thyme, oodles of basil, baby spinach, some flowers, and of course our favorite Soledad Goat Cheese. I know I’ve said it before, but we really welcome your ideas about what to make this week since we have tomatoes coming out of our ears. We’ve already whipped up some pizza from scratch with thinly sliced tomatoes a la Christy’s old suggestion, so please send in your new ideas. We’re especially hoping for some tips on making and freezing/preserving tomato sauce for the tomato-less months ahead. Who knows, you might get a dish named after you. The “Farmer’s Market Bounty” series is a weekly, typological photo essay of my Market shopping, which charts the possibilities of seasonal eating. “For my most recent birthday, my dear husband presented me with my very own ice cream maker (I’d given him a smoker for his birthday, so we were officially even, in terms of our new culinary toys). It’s a Cuisinart 2 quart deal, and it’s rapidly becoming my best pal. As I’ve got a crazy sweet tooth, and live in rural western Kentucky where my only ice cream options are Dairy Queen or the Wal-Mart freezer, the chance to have nonchemical, noncorporate ice cream was indeed a cause for celebration. For those who are looking for a way to use local nuts and fruits, I can’t recommend an ice cream machine highly enough, not to mention David Lebowitz’s The Perfect Scoop. He’s got great recipes for the basics (chocolate, vanilla, coffee), as well as the more esoteric (roasted banana, goat cheese), and his prose is perfect for the beginner, straightforward and unsnobby—you’ve got to love a guy who argues that peach ice cream demands dispensing with the niceties of freezing & advises just to eat it straight out of the machine instead. And of course, the nifty thing about making ice cream is that almost every recipe calls for the same basic stuff: milk, cream, sugar, and sometimes eggs: it’s a template that can be modified to just about any sweet or savory ingredient you’re looking to play with. I’ve made a couple of batches of vanilla that turned out really well, but my most recent foray into chocolate brought on a certain philosophical crisis on my part. The recipe seemed innocuous enough: milk, cream, sugar, vanilla extract, pinch o’ salt, and Green & Black’s Dutch-processed cocoa and Scharffen Berger unsweetened chocolate that we’d gotten at a Whole Foods during our last trip to Nashville (such “stocking up” trips are pretty much S.O.P. for many folks in our neck of the woods). 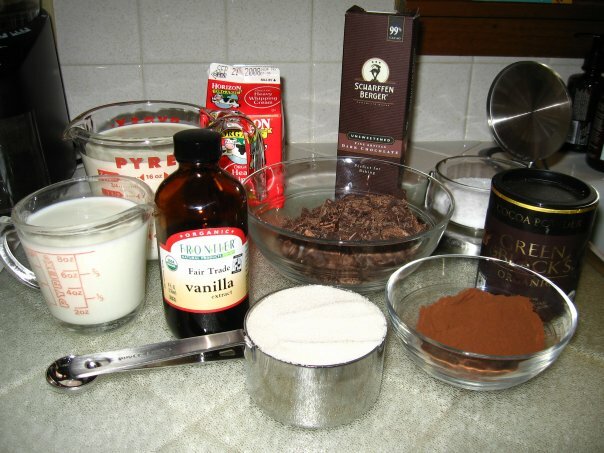 All the recipe required was heating the cream, sugar, cocoa, and salt to a boil, then adding the chocolate until melted, then the milk & vanilla (all the recipes are the same from here on out: chill the mixture, churn in the machine for 25 minutes or so, then freeze for a couple of hours). Every time the holidays rolled around my grandmother would take orders for pie. When we arrived for dinner, a neat row of steaming pies with buttery golden crust oozing with fruit fillings would be lined up on the kitchen counter. Now I’m not talking about little bitty personal pies, no my grandma would bake from scratch a big ole pie of our choosing for each of us. Our family tends to err on the side of cooking too much food to make sure everyone has enough and every meal is a celebration. From appetizers, through the main course and heaping sides, our bellies would bust with my grandma’s savory delights. Come dessert time, my brother and I used to take a seventh inning stretch on the couch because we were so full. But there was always room for pie. My grandmother died while I was still young, so my taste buds hadn’t matured past cherry or apple, but my brother had settled on lemon meringue and my mother chocolate-pecan. My sister and father were the sophisticated ones whose refined palate asked for plum pie. Depending on the season, the variety would change. 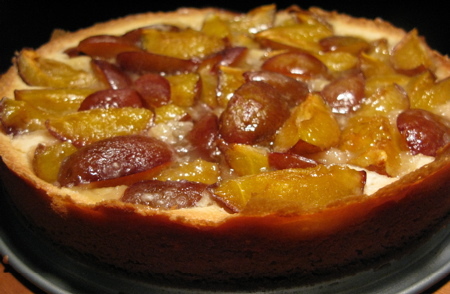 Sometimes it was elephant plums, but their Autumn favorite was prune plum pie. Thankfully my mother happened be visiting this weekend. I almost walked past the purple critters overflowing from a Farmer’s Stand until she pointed out the plums that were my grandma’s secret (and as serendipity would have it was their last week in season). I was too young to remember what they looked like and I had forgotten what the pie even tasted like. In fact, I wasn’t even sure I had ever any since my sister and father would eat straight from the tin, finishing the entire pie before coffee was served. In hindsight, I have my grandmother Cele to thank for my insatiable hunger for baked goods. This weekend I picked up a basketful of prune plums hoping to share a piece of my stomach’s lineage with the Wife. If my parents didn’t happen to be visiting, I would have never known those little plums were the infamous variety my grandmother used to make into pies every year as Summer bled into Fall. As luck would have it, this was their last week in season, and I could recreate the heirloom recipe. 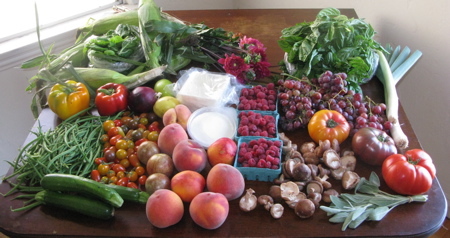 Summer is finally coming to a close and the Farmers’ bounties are starting to show the seasonal drift. I’ll have to wait until next year for more of those blood of the bowl peaches that I couldn’t get enough of last Sunday. 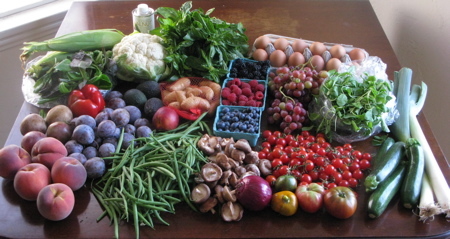 This week we picked up a boatload of prune plums (stay tuned for grandma’s pie adventures), raspberries, blackberries, blueberries, heirloom and cherry tomatoes, grapes, a nectarine, peaches (O’Henry variety), pluots, avocados, red onion, red pepper, probably our last of summer corn, shitake mushrooms, haricot verts, leeks, cauliflower, mixed greens, arugula, bunches of basil, Lily’s eggs, and Hollywood Farmer’s Market newcomer La Nogalera organic Walnut Oil (that we tossed with those fingerlings and rosemary and roasted tonight). We’re going to be out of town these next two weekends, so sadly this was be our last Hollywood Farmer’s Market pilgrimage for the month of September — only nature knows what gastronomic wonders await us when we return. As usual, we welcome ideas about what to make this week, so please send in your ideas. Who knows, you might get a dish named after you. The word for the day is Bubalus Bubalis. And for those of you who didn’t pass Latin, that means Water Buffalo which happen to produce a milk that is not only healthier and more nutritious for you than cows milk, it makes a mean cheese. We’ve been getting ricotta cheese from one of the fine purveyors at the Market for a few weeks now from some very stoned cheese men. This week, in a moment of cannabis clarity, our cheese monger was able to tell us that our fabulous ricotta that we’ve been whipping into gnocchi is actually from Bubalus Bubalis (and was made on Friday). No wonder it tasted so darn good (and now all my I have way too high cholesterol to be eating this much cheese but I just can’t stop myself guilt has just dialed down a notch). This week was Heirloom Tomato Festival at the Hollywood Farmer’s Market and a few revelers dressed up in red felt fat suits for the occasion. We picked up some heirlooms and cherry tomatoes to do our part along with some raspberries, blackberries, blueberries, figs, pluots, peaches, nectarines, avocados, lemons, spinach, mixed greens, bi-color corn, fingerling potatoes, zucchini, carrots, leeks, chanterelle mushrooms, shitake mushrooms, charlynn melon, basil, thyme, sage, Soledad Goats goat cheese, and of course Bubalus Bubalis ricotta from Bubalus Bubalis Inc (sorry couldn’t help myself there). One of my peach purveyors doubled the size of her stand to celebrate summer fruit making it’s last stand before autumn rolls in. The Market was teeming with shoppers gearing up for Labor Day bashes and this week we picked up beautiful bi-color corn, heirloom tomatoes, cherry tomatoes, raspberries (for homemade ice cream of course), peaches, nectarines, pluots, grapes, haricots verts, red onion, peppers, lemons, shitake mushrooms, zucchini, leeks, spinach, basil (for pesto), sage, flowers, fresh ricotta (yes we can to gnocchi), and last but not least creamy goat cheese from our favorite Soledad Goats. A special kudos to Carol from Soledad Goats who told me four of her goat cheeses picked gold medals at the LA County Fair. The Italian translation for gnocchi — the soft tender dumplings made from potatoes, semolina, flour, bread crumbs, or ricotta — is the word lump, and is derived from the word nocchio, which means a knot in wood. But the real story behind gnocchi was recently uncovered in the files of the late great writer and folk fable collector, Italo Calvino. Once upon a time, a Roman villager left his wife to go on a long journey. When it came time for his return on the second moon of the new season, his wife wanted to make him a celebration. But their fields had gone fallow since he’d been gone, and their hungry goat went on strike and stopped producing milk. The wife went into the forest to forage the fruits of nature, but the nuts and berries had all been plucked by hungry villagers. Perched on a tree stump, her elbows and knees scraped from thorns, she began to weep. Suddenly, the tree that she was sitting on began to quake and quiver, startling her. “Young woman, why is it that you weep,” the Tree asked. And the woman told the Tree about how her husband was returning and she would not be able to give him a proper welcome. The Tree lifted down its branches and said, “collect the knots of my branches, bring them home, and cook them for your husband.” The woman smiled at the Tree, touched at the gesture and responded,”I thank you for your generosity, but I could not take your knots from you.” The Tree, sensing that the Woman was wary of feeding her husband wood, insisted, “Do not worry, my knots will make a meal fit for a king.” And with that, he started to rip the knots that formed in the crooks of his twisted branches until he filled her empty basket. The Tree said, “All I ask is that you cook them with love and attention, and your husband will have the best meal of his life.” And so the woman returned home to prepare for her husband’s arrival. Back in her kitchen, the Woman started a fire. As she placed the dark, gnarled knots in a cauldron, her goat snuck into the house and nuzzled her legs. She had worked up a little milk and wanted to share her bounty with her Mistress. The Woman leaned down to milk her goat, happy that she would be at least be able to give her husband fresh milk. And at that very moment, her husband came in through the door and whisked her off her feet into a loving embrace. The wife gave the husband a glass of goat’s milk which he hungrily drank up. He asked what was cooking at the stove, noting it smelled wonderful. When the wife turned back to the cauldron, she could not believe her eyes — floating atop the pot were not gnarled knots, but soft, white pillowy dumplings. “Gnocchi,” she proclaimed, and ladled out a plateful. “Wooden Knots,” the husband said with a curious smile, excited for a new experience. 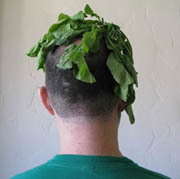 From under his hat, he produced a handful of cherry tomatoes, a bunch of fresh basil, and a jug of Nero d’Avola wine. The wife quickly made a simple sauce with the tomatoes and basil, while the husband poured the wine and lit a candle. And together again, they sat down for the most memorable meal of their lives. 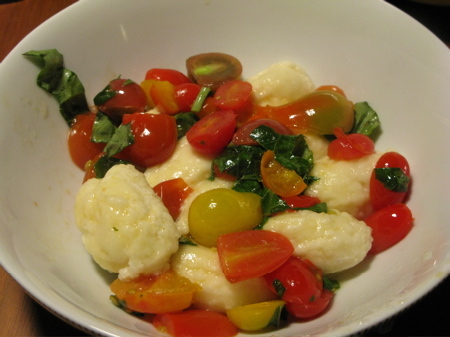 Last week after an epic airport nightmare getting home to LA, I came home to a plate of steaming ricotta gnocchi with heirloom cherry tomatoes, fresh basil and ricotta from the farmer’s market, complements of my wonderful wife and inspired by Judy Rodgers from her amazing Zuni Cafe Cookbook.